If you're like me, news of the planned NIH study may make you wonder: Does the world really need another investigation of alcohol's health benefits? If you're like The New York Times, on the other hand, you wonder how a study funded largely by Big Alcohol can avoid being biased. Over the years, there have been innumerable studies on this topic. Most have found that moderate drinking is linked to fewer occurrences of heart attack, ischemic stroke, and death from heart disease. The medical journal BMJ published just such a study in March. 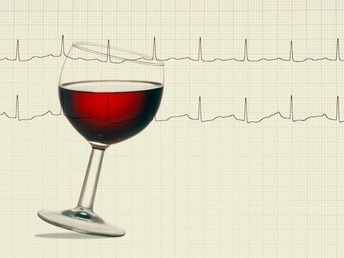 It concluded that drinking in moderation — one to two alcoholic beverages per day — "is associated with a lower risk of ... several but not all cardiovascular diseases." For eight common heart ailments, both non-drinkers and heavy drinkers were at greater risk than moderate drinkers. In short, having a little alcohol tends to be good for you; having too much or none at all tends to be bad. Last week, a study published in Health Affairs came to a related finding. Analyzing data on 14,000 older Americans, researchers from the University of Michigan and from the Max Planck Institute in Germany determined (in UPI's paraphrase) "that individuals who consumed alcohol in moderation lived seven more years than the general population." According to Harvard's Chan School of Public Health, more than 100 longitudinal studies have reached comparable conclusions: A drink or two a day can be just what the doctor ordered, and "the effect is fairly consistent, corresponding to a 25 percent to 40 percent reduction in risk." So why the new NIH study? Dr. George Koob, director of the National Institute on Alcohol Abuse and Alcoholism, says it will be the first in which researchers monitor health effects that develop during the trial. Consequently, says Koob, interest in this study will range "from the World Health Organization to the beverage companies ... to regular American citizens." The Times has a different interest. It reports that nearly two-thirds of the study's hefty tab is being picked up by five leading beverage manufacturers — Anheuser-Busch, Heineken, Diageo, Pernod Ricard, and Carlsberg. They have committed $67.7 million to a foundation that raises money for the National Institutes of Health, causing "concern among researchers who track influence-peddling in science." But is there any good reason for industry funding to be inherently suspect? There is no indication that the corporate donors will have any involvement in the design or conduct of the study. The project's principal investigator, Harvard Medical School Professor Kenneth Mukamal, told the Times he hadn't even known about the companies' backing. "This isn't anything other than a good old-fashioned NIH trial," he said. "We have had literally no contact with anyone in the alcohol industry in the planning of this." Gemma Hart, an Anheuser-Busch vice president, concurs: "We have no role in the study. We will learn the outcome of the study when everybody else does." Of course it is wise to be wary of conflicts of interest; when corruption in research is discovered, it should be publicized and penalized. But "industry" and "corrupt" are not remotely synonymous. Business is indispensable to scientific exploration and employment. It is no more logical to automatically distrust research funded by industry than to distrust research funded by government, advocacy groups, or opinionated philanthropists. Research is expensive and someone has to pay for it. Chase away a major source of scientific funding, and the result will be less research. Scientific progress doesn't depend on eliminating preconceived notions or institutional predilections. It depends on testing hypotheses, and replicating earlier research. Industry dollars can and do underwrite excellent science, including when it comes to alcohol. The best system? Keep the funding transparent, and let the NIH do its work.